All of us have faced troubles and difficult times. However, we all have different ways of reacting and dealing with trying circumstances. While it’s easy to become discouraged or even bitter when Life seems to be pouring rain on our heads, there’s a better way. A Dancing in the Rain retreat can explore this idea and help women navigate difficult times with a more spiritually positive attitude. and when you pass through the rivers, they will not overwhelm you. You will not be scorched when you walk through the fire, and the flame will not burn you. Having a spiritually positive attitude is about more than just “looking on the bright side.” These verses clearly state “WHEN you pass through the waters” and “WHEN you walk through the fire,” not IF. We will have troubles in life. But when we go through even unspeakable hardships, we are never alone. God has promised that He WILL be with us! The support and encouragement of fellow believers is an invaluable resource. This is one key reason that believers are instructed to be a part of a body of believers. Surrounding yourself with people who can offer words or encouragement, prayer, or just a listening ear can be the difference between joy and bitter despair. It’s also beneficial to those going through difficult times to work on encouraging others. When we are a blessing to others in need, we find ourselves being blessed in the process. Troubles and heartaches are a necessary part of life. However, as believers, we do not have to live a life of defeat. The Lord has already overcome the world and all its suffering for us. All we have to do is trust Him to carry us through the turmoil. We can have peace, even in the midst of our most troubling storms when we rest in Him. This is a cool and unique craft that can be customized to your retreat or even to the individual tastes of your attendees. It requires easily available supplies: canvases, glue, crayons and a heat gun (or hair dryer with a high heat setting.) Attach the crayons over your custom design and melt them into colorful raindrops using the heat gun. Voila! A one-of-kind art piece! Rainy days don’t have to be gloomy! This fun craft can turn a gray, rainy day into a beautiful, musical experience. Simply choose one the simple designs to create a gorgeous rain chain for a porch or overhang. Supplies are simple, ranging from small terra-cotta pots, to beads, to old spoons. Combine materials for a truly unique design. Rainbows are a symbol of God’s promises, so what better way to brighten up a gloomy day? This no-sew fabric garland can be used for parties, or as just a beautiful window or wall hanging. Provide plenty of colorful fabric and a sturdy cord to know the fabric on. This craft will go faster if the fabric strips are measured and cut ahead of time. This game is perfect to use as an ice-breaker or get-to-know-you game. Have your attendees write down their names and one secret fact about themselves on a small notecard. Gather the notecards and call the attendees up, three at a time. Give them each a notecard and instruct them to convince the group that whatever the card says is true about them. Be prepared for deep belly-laughs as the ladies fashion tall tales in order to win the game. We’ve all had bad days and experienced moments of frustration. Help your ladies commiserate and laugh together with this fun bingo game. Simply use this bingo card template to create cards full of humorous and embarrassing moments that have likely been experienced by many people. For example, squares on the card could say: Locked Your Keys in the Car, Wore Two Mis-Matched Shoes to Work, or Fell Off the Treadmill at the Gym. Keep it light and humorous and reward the first person to fill up a line or their whole card with a small prize. This is a fun team-building game and a perfect exercise to demonstrate the importance of a support system. Divide your group into teams. Tell them that they have been marooned on a deserted island and they must as a group decide and agree upon what items or supplies they have brought with them. Give them a limited amount of time to work together to come up with a survival plan that benefits everyone in the group. Even though this object lesson is meant for children (and St. Patrick’s Day), the message holds true for all believers. This simple and beautiful lesson can be easily modified for adults to demonstrate God’s provisions for His children and the promise He gave them to always be with them. Oftentimes, the most encouragement we can find comes from those who have been through difficult times and lived to tell the tale. Invite a guest speaker to share their story of survival of hardship, temptation, or even tragedy and how they overcame through God’s power and provision. If possible, have the guest bring specific faith-based resources and materials to help and encourage others who may be facing similar situations. Difficult times don’t have to mean depression and despair. As believers, we’ve been given the promise of God that He will go with us and help us overcome our difficulties. We can surround ourselves with loving people who will uplift and encourage us. 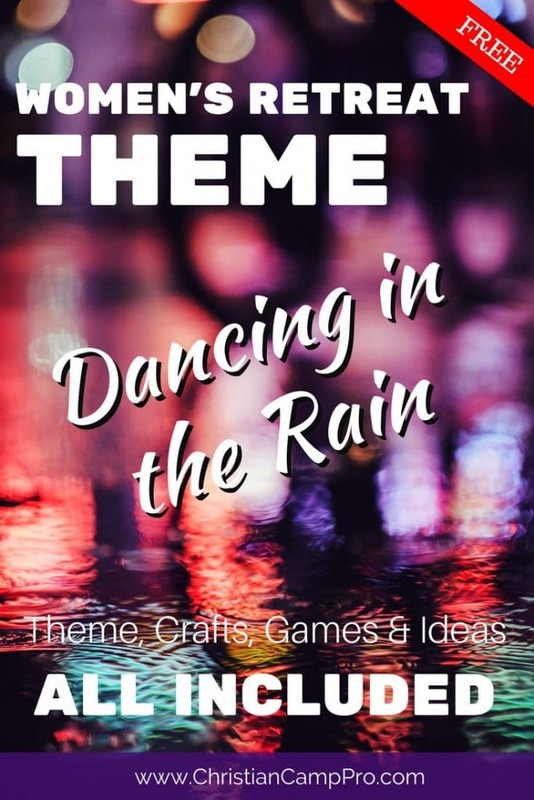 A Dancing in the Rain retreat can help remind ladies that they are not alone. God has given us what we need to weather the storm and wear a smile even when the rain pours down.